Everything works better if maintained regularly, especially you – an organic expression of energy, consciousness, and, in my case, various neuroses. The problem is that often times, we don’t know where to begin with self-care. Have you ever let a room get so out-of-control that it’s easier to just shut the door rather than deal with it? Yeah, me neither. I certainly haven’t ever shoved piles of unfolded laundry and unsorted junk mail into a room, closed the door, and warned my children in a dark whisper, “Hush. We mustn’t anger it.” Absolutely not. But for the sake of metaphor, let’s say you know what I’m talking about. If I’m not attentive, this is what I do with my mental and physical needs, until the mess has reached epic proportions. And, then what? Where do I even start? My life is falling apart; maybe quinoa would help? I’ve accepted that I will never be a schedule person. I can barely even manage to get my car in for an oil change before the engine starts knocking. I let the water filter light on the fridge blink for an embarrassingly long time before I finally change the thing. If the dentist’s office didn’t hound me send me helpful reminders, I would have my teeth cleaned once a decade. But you know what I’m pretty okay at? Random acts of self-care. Pouncing on small opportunities to tend to myself. They almost never involve quinoa. 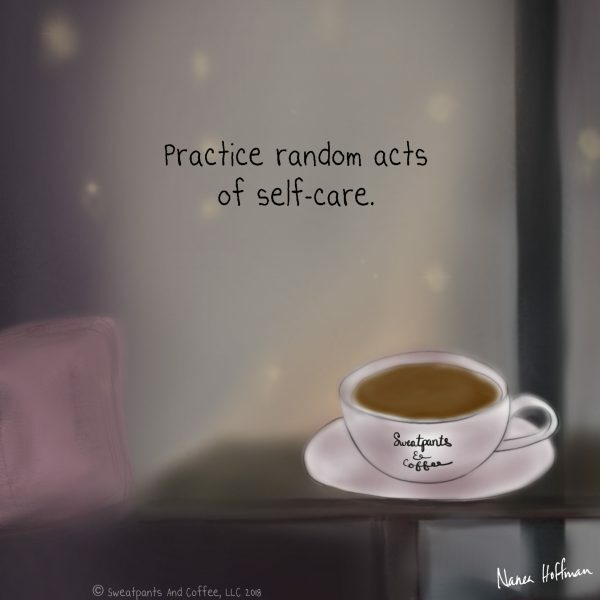 If you’re like me and can’t manage to formulate much less stick to a self-care regimen, you might be better off practicing random acts of self-care.